Gidget is a 1959 Columbia Pictures CinemaScope feature film. It stars Sandra Dee, Cliff Robertson, and James Darren in a story about a teenager's initiation into the California surf culture and her romance with a young surfer. The film—directed by Paul Wendkos—was the first of many screen appearances by the character Gidget, created by Hollywood writer Frederick Kohner (and based on his own daughter). The screenplay was written by Gabrielle Upton, a nom de plume of Gillian Houghton, who was then head writer of the soap opera The Secret Storm. This would be Upton's sole contribution to the Gidget canon. The story was based on Kohner's 1957 novel Gidget, the Little Girl with Big Ideas. The film, which received one award nomination, not only inspired various sequel films, a television series, and television films, but is also considered the beginning of the entire "beach party film" genre. Gidget is credited by numerous sources (Stoked! A History of Surf Culture by Drew Kampion; The Encyclopedia of Surfing by Matt Warshaw; and Riding Giants a documentary film by Stacy Peralta – to name just three) as the single biggest factor in the mainstreaming of surfing culture in the United States. Frances Lawrence (Sandra Dee) is about to turn 17 and is on her summer break between her junior and senior years of high school. She resists the pressure to go "manhunting" with her girlfriends and laments the days when the girls had fun together without boys. Frances also rejects her parents wishing to fix her up on a date with the son of a friend of the family, Jeffrey Matthews. On a jaunt to the beach with her well developed girlfriends, flat-chested tomboy Frances meets surfer Moondoggie (James Darren). She quickly becomes infatuated with him, but he shows no romantic interest, however Frances is more attracted to surfing than man hunting. At home, Francie importunes her parents for $25 for a used surfboard. Russ and Dorothy Lawrence (Arthur O'Connell and Mary LaRoche) grant their daughter's request as an early birthday present and the excited youngster returns to the beach to surf. The gang dubs their female associate "Gidget", a portmanteau word based on 'girl' and 'midget'. She associates with an all-male surfer gang led by the worldly beach bum, The Kahuna (Cliff Robertson). Kahuna is a Korean War Air Force veteran twice the age of Frances who was fed up with all the rules he had to live by when he flew combat missions and dropped out of normal society. He travels the hemisphere surfing with his pet bird. Moondoggie admires Kahuna and wants to emulate him by joining Kahuna in working his way on a freighter to go surfing in Peru at summer's end instead of going off to university as his self-made father planned. Kahuna and Gidget enjoy each other's company with Gidget questioning how he can survive an aimless and lonely existence without a job. She questions whether if Kahuna knew then what he knew now would he still make the same lifestyle choice after leaving the Air Force. Kahuna later reflects on Gidget's words after the death of his only friend, the pet bird. Hoping to make Moondoggie jealous, Gidget hires one of the other surfers in the gang to be her date to a luau party on the beach. Her plan backfires when the surfer she hired pawns the job off on none other than Moondoggie, unaware that he was the one Gidget wanted to make jealous. Gidget lies and tells Moondoggie that it is Kahuna that she wants to make jealous, and they have a romantic evening at the luau. Eventually Moondoggie says something that upsets Gidget and, as she flees the luau, she runs into Kahuna and agrees to take him to a nearby beach house. Alone with Kahuna, Gidget tries to make Kahuna take her virginity. Amused, Kahuna attempts to call Gidget's bluff by pretending to take her up on her offer but finds himself falling under her spell. Realizing what he was about to do and angry at the situation he's been put in, Kahuna throws her out of the beach house just as Moondoggie arrives. Gidget is mortified and escapes out the back of the beach house as Moondoggie confronts Kahuna. The cops are called to break up the fight between Kahuna and Moondoggie and, after leaving the beach house, they find Gidget stranded with a flat tire and without her driver's license. They take her in to the police station. Gidget's father, having heard about the incident decides to take over control of her social life, and orders her not to see the surfer gang again. She falls into a depression, to which mother shows her a tapestry from her grandmother reading "A Real Woman brings out the best in a Man". In the end, Mr. Lawrence arranges a date for Gidget with Jeffrey Matthews that Frances grudgingly accepts. To her surprise, Matthews turns out to be Moondoggie. The two return to the beach to find Kahuna tearing down his beach shack and find out that he's taken a job as an airline pilot. Moondoggie and Gidget realize how they feel about each other and, as an act of romantic devotion, Moondoggie asks Gidget to wear his class pin. Kahuna cheerfully warns Moondoggie that Gidget is quite a woman. Sue George as Betty Louise aka B.L. The studio wanted Elvis Presley to play the role of Moondoggie, but he was in the United States Army at the time. Malibu surfers Miki Dora and Mickey Munoz appear in the surfing scenes. Fred Karger composed "Gidget" with lyrics by Patti Washington, and "The Next Best Thing to Love" with lyrics by Stanley Styne. James Darren sang both numbers on-screen while The Four Preps sang "Gidget" over the opening credits. At the beach party scene, The Four Preps rendered "Cinderella", a number by two members of The Four Preps, Glen A. Larson and Bruce Belland. The film was shot during the winter of 1959 at Leo Carrillo State Park. Sandra Dee originally was going to film the sequel Gidget Goes Hawaiian but didn't. Rose Marie Reid designed all of the women's swimsuits in the film. Howard Thompson wrote in the New York Times of April 23, 1959, "[The film] is enough to make anybody leave one of the neighborhood theatres, where it opened yesterday, and light out for Long Island Sound. Pictorially, this mild little Columbia frolic, about a teen-age girl with boy trouble, seems an ideal way to usher in the beach season." He praised performers Dee, Robertson, and La Roche. Craig Butler in Allmovie notes, "Although the very title prompts snorts of derision from many, Gidget is actually not a bad little teenaged flick from the '50s. Great art it definitely isn't, but as frivolous, lighthearted entertainment, it more than fits the bill. Those who know it only by reputation will probably be surprised to find that it does attempt to deal with the problems of life as seen by a teenager—and that, while some of those attempts are silly, many of them come off quite well. It also paints a very convincing picture of the beach-bum lifestyle, much more so than the Frankie Avalon–Annette Funicello beach party movies." The popularity of the film led to a "Miss Gidget" contest which was won by Barbara Bouchet in 1959. Within ten years of the film's release, two sequels, a television series, and a telemovie were produced. Theatrical releases included the sequel films Gidget Goes Hawaiian (1961) starring Deborah Walley, and Gidget Goes to Rome (1963) starring Cindy Carol. In 1965, Sally Field played Gidget in an ABC television series that was canceled after one season. In 1969, a telemovie Gidget Grows Up starring Karen Valentine was aired. The adult Gidget character then appeared in the telemovies Gidget Gets Married (1972), and Gidget's Summer Reunion (1985). Another television sitcom was produced in 1986, The New Gidget starring Caryn Richman. Although the original Gidget was blonde, subsequent Gidgets sported a variety of hair colors. On November 10th, 2017, Twilight Time Movies released Gidget (1959) on high-definition Blu-ray as a limited edition (3000 copies) release. In 1987, Gidget was spoofed in the off-Broadway play, Psycho Beach Party. Written by and starring Charles Busch, the play follows a Gidget-like character called "Chicklet" as she copes with a series of bizarre murders among her surfer crowd. In 2000, a film was released based on the play. Rather than reprising his off-Broadway "Chicklet" role for the film, Busch created and appeared as a new character for the production called Monic Stark, a female police officer. The film received a 1960 Golden Laurel Award nomination for Top Female Comedy Performance for actress Sandra Dee. ^ Variety film review; March 18, 1959, page 6. ^ Harrison's Reports film review; March 21, 1959, page 46. ^ "A Generation of Gidgets", by Jeff Spurrier, The Atlantic Monthly, April 2002 Retrieved 4 August 2009. ^ "Surfer Girl, Forever" by Hugo Martin, The Los Angeles Times, June 17, 2006. Retrieved 4 August 2009. ^ "Gidget: It's the summer of 69". Retrieved 14 January 2017. 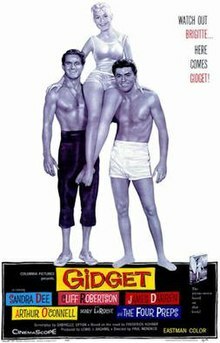 ^ "Gidget (1959) - Notes - TCM.com". Retrieved 14 January 2017. ^ "Sandra Dee Out West: Page 2". Retrieved 14 January 2017. ^ Layton, Roger (28 August 2015). "Iconic swimsuit designer the subject of new exhibition at BYU Library". Herald Media. Retrieved 20 January 2016. In 1959, Sandra Dee and the other female co-stars of the film "Gidget" all wore Reid’s suits. ^ New York Times review. Retrieved 1 October 2008. ^ Allmovie review. Retrieved 1 October 2008. This page was last edited on 20 March 2019, at 13:51 (UTC).